Michelangelo’s David and Rodin’s The Thinker have been recreated as domestic demigods for a campaign to promote Samsung’s new QuickDrive washing machine. Samsung at One New Change experiential activity. Source: Marcomm News. The pair, visiting London for a limited time, are a twist on new research by Samsung that shows 75 per cent of men admit to being clueless when it comes to using domestic appliances and about half are put off a household task because they find domestic appliances too confusing to use. 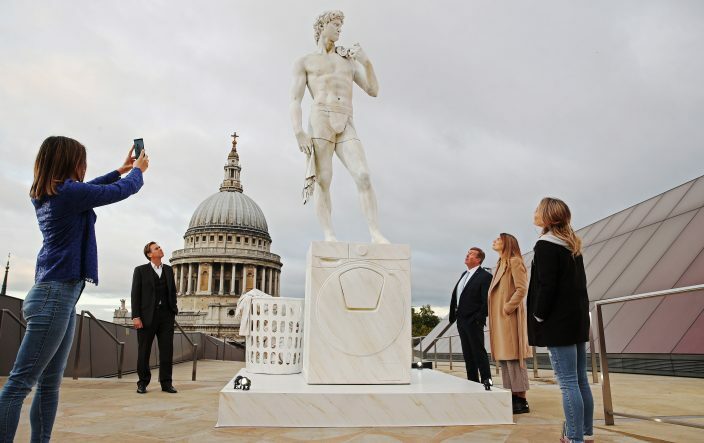 “We have updated these classic sculptures in a playful bid to remind the public that our home appliances are masterpieces of modern design,” Samsung Electronics UK and Ireland head of marketing for home appliances Ruth Storey said. The modernised statues are being installed at high footfall locations around London. Domestic David can be viewed at One New Change from 3-4 October and The Clean Thinker is at Kings Cross Station from 7-8 October. This entry was posted in BLOG, NEWS, UNCATEGORISED and tagged brand experience, Experiential, London King's Cross Station, News, One New Change, Samsung. Bookmark the permalink.